Seeking to discredit Republicans during the 1864 presidential campaign, Democrats coined and applied the term “miscegentation” to the Republican platform. Democrats argued that the equality promoted by Republicans was in actuality an attempt to further intermingling between races. This print, the second in a series of anti-Lincoln satires by Bromley & Co. in New York City, expresses the anxiety felt by many over the potential consequences of the equality embraced by Republicans. 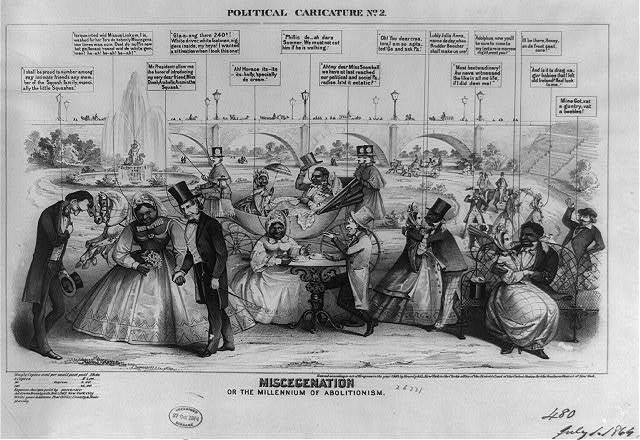 The repercussions of equality, as envisioned by the artist, include the dissolution of the color line with the seduction of a white woman by a black dandy (to the far right) and the breakdown of the correlation between color and class with the wealthy black family attended by their white servants (middle, second row).